Showrooms are designed to evoke a positive psychological and emotional response from patrons when they first enter the product display area. 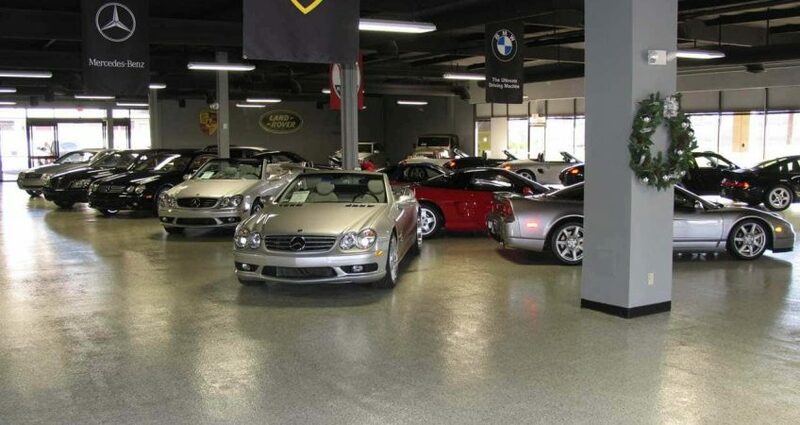 Whether it is a car dealership incorporating a sense of style and sophistication to complement its line of high-quality polished vehicles, or a home decor gallery seeking a unique personality to display modern furnishings within, epoxy showroom floors are the premiere choice of flooring materials for many reasons. Bright and professional appearance – showrooms are a highly visual environment, designed to showcase the business product line and to positively influence the buyer’s purchasing decision. A flooring choice which brightens the environment yet maintains a serious-minded professionalism is a unique quality of epoxy coated floors. With a wide choice of colors and the option of a high-gloss finish, epoxy floors will give any showroom distinction and character. Withstands heavy traffic and harsh environments – not to mention the slip and skid resistance of an epoxy coating provides a durable coating to handle not only constant foot traffic but also the movement of vehicles without damage. Resistant to stains, chemical spills, water and heat – epoxy coating is one of the toughest finishes on the market today, as proven with ASTM testing to provide superior performance in harsh conditions. From the showroom to the shop floor, epoxy outperforms vinyl, linoleum, ceramic tile, and rubber flooring. Easy to clean and maintain – will save any business on commercial janitorial costs compared to carpeting and other flooring materials. As a high-performance flooring system maintaining its pristine condition involves little more than regular sweeping and mopping. The initial installation of an epoxy showroom floor will yield years of maintenance-free service. Decorative flooring installed directly over concrete – and is available in solid colors, granite-like patterns (acrylic chip), or a colored-quartz matrix. The decorative, smooth surface will turn a drab, monotonous space into a dazzling and vibrant area that motivates employees and positively affects patrons. Lower per-square-foot cost – has made epoxy a leader in commercial and industrial flooring options due to the lower cost of installation and the system’s longevity, which is measured in decades. Epoxy coated flooring systems do not rely on water-based adhesives as does luxury vinyl sheet (LVS). This eliminates the many issues that can arise from vinyl or tiled flooring, such as seam separation, bubbling, and seam cracking. Epoxy coatings are a fluid, industrial-grade resinous-type system that offer a high level of performance and a no-wax maintenance solution. An initial consultation by an epoxy flooring systems specialist will assess the quality and condition of your concrete floor foundation, and determine the humidity level of the floor to be sure the area is relatively free of moisture. For optimum performance of the epoxy, the concrete floor is cleaned by shot-blasting or diamond-grinding, which not only cleans but also micro-polishes the concrete surface. The final Resinyte floor coating epoxy is applied in the desired color or aggregate profile to achieve the perfect showroom floor decor. Additional chemical resistant and anti-skid additives are also applied at this time. Contact us for full system performance data on our enhanced PD epoxy line for a wide variety of applications.